Pre Draft Report: Coming into the 2011 draft Wright had been previously drafted in the 23rd twice electing to not sign both times (Pirates in 2008 and Red Sox in 2010). Wright was expected to be a top 10 round pick based on his fastball and curveball. His fastball sits in the low 90s touching 94 making it plus for a lefthander, his curveball is average with a chance for more. His change up is almost non-existent profiling Wright as more of a reliever than starter long term. Career Synopsis: Wright got his career started at Williamsport in the NYPL. Wright put up great numbers over 8 games with a 3.38 ERA, 13BB, 44 K line over 34.2 IP. He was then promoted to Lakewood were he put up even better numbers in 7 games, 2.67 ERA, 9 BBs, 41 Ks, and 33.2 IP. This debut earned in the ranking of the #26 prospect in the Phillies’ system by Baseball America. 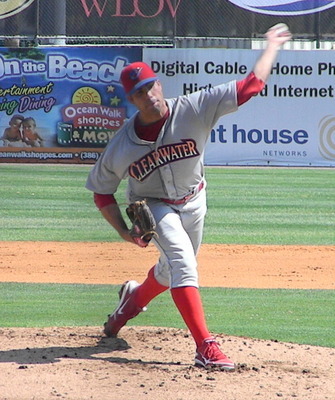 In 2012 the Phillies sent Wright to full season ball in Clearwater. His year earned him the Pitcher of the Ear in the FSL as voted on by the managers of the league. His final line was 11-5, 3.47 ERA, 60 BB, and 133 Ks. Summary: Wright has a plus fastball and average change up in a starter’s frame. The problem is that the results have not always matched the stuff and his command and control can be suspect at times. Additionally he is still working to develop a change up but it is far away from being more than a show me pitch. Upside: Wright’s development hinges on the development of his change up. If he can develop at least an average third pitch he can stick as a starter, if so he profiles as a low end #3 or #4 pitcher depending on his ability to throw strikes at higher levels. If he cannot develop a change up he has the ability to move quickly as a high leverage lefty reliever.